Real Madrid allowed only four shots on goal in the 2nd leg of the Champions League semi-finals against Guardiola’s FC Bayern München. Is Guardiola’s Tika-Taka finished or has Carlo Ancelotti simply developed an enormously effective counter tactic? It is commonly said that Ancelotti has taught Real how to defend. This is somewhat surprising. After all, Ancelotti’s predecessor is none other than master mason José Mourinho. Yet, it is an open secret that he has taken over the Council seat of veteran pressing master Arrigo Sacchi. In this analysis, we want to devote ourselves to a handful of scenes to check out how much Sacchi is behind the processes and mechanisms of Real’s new pressing. Arrigo Sacchi took over AC Milan in 1987 after he had beaten the team twice in the Coppa Italia with then second-class AC Parma. At the start of his coaching time he reformed his basic tactical principles in defense and attack. What remains particularly memorable is the dominant pressing that Sacchi installed. The crucial idea of his pressing was to control space. 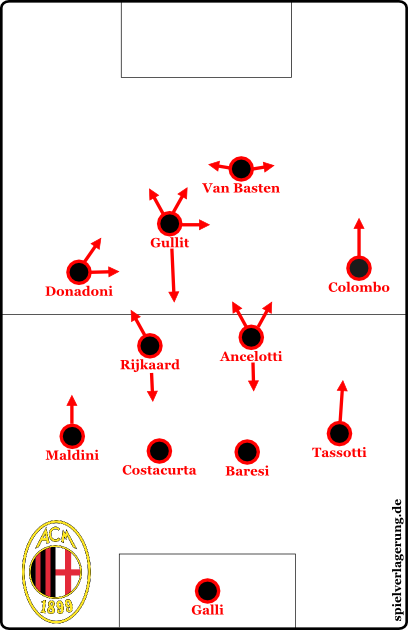 Despite maximum compactness – Sacchi demanded a maximum of 25 m between the defensive line and the forwards – the entire field could be controlled. The arc-like interpretation of the formation was an important means of achieving this goal. Even if there is no explicit evidence, the following statements about the use of cover shadows and the option-oriented cutting off of passing options suggests they were key objectives. The highlight of AC Milan’s time with Sacchi was a 5-0 victory against Real Madrid in the semifinals of the European Cup on April 19, 1989. The central midfielder in that team, and the scorer of the first goal, was Carlo Ancelotti. Organization and movement patterns in their pressing. The red circles represent the preferred isolation zones. Real’s pressing against Bayern Munich, as in the first leg or the final of the Copa del Rey against Barcelona, was basically organized as a high midfield press from a 4-4-2. However, there were short periods of an attack pressing 4-3-3 that were gained by a midfielder moving up in response to a ball-carrying Bayern player having a bad Sichtfeld (view of the field) after a poor pass. The midfield pressing was organized symmetrically in various pressing units. Due to the specific player roles and the organizational patterns of Bayern, however, slight asymmetries could arise. The two strikers, Benzema and Ronaldo, played mostly as space blockers. The decision as to who controlled the isolation zone is shown above. In most cases, Ronaldo took his comfort zone in the left offensive half-space, so that Benzema was either central to pin the attack directly on Bayern’s left wing, or slightly wider to handle the central isolation zone. This variant was the preferred choice, especially when the ball was in the central position of a back three; e.g. when Toni Kroos dropped between the central defenders. The targeted releasing of this central zone by Real can be seen in the heat map. The four midfielders played as a compact unit, funneling the ball carrier and thus isolating him from the rest of the game. This concept is strongly reminiscent of Sacchi’s AC Milan. To accomplish this, the basic positions of Angel di Maria and Gareth Bale were slightly higher than those of the central midfielders Luka Modric and Xabi Alonso. They would either cut off the wings via their cover shadows or support the full-back in isolating Bayern on the wing. This allowed them, in the higher zones, to force Bayern into making bad passes. Since the ideal of compact funneling could not be maintained continuously due to the high ball circulation rate, attention was paid to a high local compactness. To this end, the near-ball central players both moved out on the wings to support the wide midfielders and defenders. The full-backs, Fabio Coentrao and especially Dani Carvajal, were enormously important when switching between the two isolation zones. When Bayern tried to extricate themselves from the central isolation zone, the near full-back pushed way up into a 3-5-2 to block the advances of Bayern until a wide player could move up and restore the local compactness. As a result, they tried to attack together and steer the opponent along the second isolation zone towards the corner flag; where they tried to win the ball. This procedure followed the ASTLB model of training to the letter: run up, face up, absorb pace, steer, win the ball. The central defenders were a well-matched pair. Ramos mostly tracked Mandzukic while balancing the movements of Pepe Ramos and Carvajal. Both central defenders frequently moved out into the intermediate line space to poke tackle or head away long balls. They were also able to benefit from the strong passing lane oriented pressing of their teammates, enabling them to recognize open passing lanes from their deeper position and anticipate passes. The choice of players was ideal for quick transition play. Karim Benzema fits the prototype of the switching nine. The physical missiles, Cristiano Ronaldo and Gareth Bale, were positioned for deep passes. Angel di Maria and Luka Modric either won or gathered up the loose balls and were able to release their outstanding dribbling qualities against the counter pressing of Bayern and be able to play perfect hole passes or shift play. Xabi Alonso served as a back-pass option behind them, but with his long diagonal balls and skillful hole passes was a perfect space jumper. Cutting off the passing lanes and isolating Bayern gave Madrid a special advantage. Many balls were won from intercepted passes or overloads. This prevented Bayern from counter pressing in their usual manner. The intercepting player had a little time and space to orient himself and could play combinations in order to free himself from the tight confines. The former was particularly fatal if the intercepting player was Modric, di Maria, or Alonso. Immediately after kickoff, Real opened with a long diagonal ball to the left wing. Both central midfielders and Bale shifted strongly to generate an overload. The idea was probably to impress Bayern with their sheer physical presence. However, the ball was cleared and controlled by Müller. Müller passed to Kroos, who played directly to Schweinsteiger. Real were pushed forward and compact on the left side while the ball was already in the middle of the pitch. There was a promising Umschaltsituation (transition situation). In this difficult situation, Real’s defense showed their class and ability to control space. Alonso and Modric moved quickly and positioned themselves perfectly. Given their close position, they created a broad cover shadow that prevented Schweinsteiger from targeting the overload in space behind Coentrao. Schweinsteiger instead targeted Ribery on the open right side of Real but Dani Carvajal responded well. He immediately took off to press Ribery as he received the ball to avoid being turned. When he had achieved his desired angle and the necessary time for his teammates to settle into defense, he let himself fall back to control the space behind him against Alaba’s forward run. At the same time, Bale switched on his turbo jets to support Carvajal against Ribery and Alaba. Just seven seconds after Müller’s header, Real was compact and in perfect order. 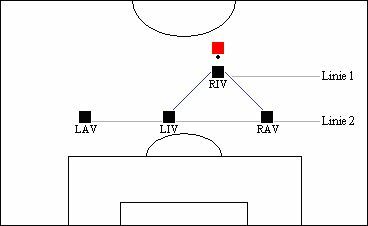 The arc-like interpretation of the 4-4-2 preached by Sacchi is clearly visible. Alaba and Ribery were already isolated. Benzema and Ronaldo remained up front for possible Umschaltsituationen. A cross to Mandzukic and Mueller wasn’t very promising due to the 4 v 2 situation. Nevertheless, it was attempted after Schweinsteiger’s detour. As a result, Bayern’s first attack against the settled formation of Real was a cleared cross. The arc-like interpretation of the midfield line was immediately used to isolate the center of the pitch. Ronaldo forced Kroos, through his run-up, to start a dribble into the center of the funnel. Once inside the funnel,all pass options to the front or to the sides instantly disappeared into Real’s cover shadow. Although Lahm, Ribery, and Robben were free, they were not playable for Kroos. In return, Real could generate an excellent local compactness around the ball. Kroos, only via his individual quality, managed to play back to Alaba shortly before the pressing trap snapped shut. Who says that the funnel can only be formed by the midfield chain? Many teams are disordered after pressing traps, because the local compactness creates spaces in other zones. But Real responded impressively again. Carvajal moved well into the midfield in his role as a space blocker and Zeitverschaffer (lit. time procurer; he gave his team time to settle back into defense in transition). These fractions of a second were used to re-create a funnel for the Bayern ball carrier. Real was incredibly flexible: Bale lined up as a central midfielder alongside Modric, while Xabi Alonso dropped back as an additional protection to Pepe and Ramos. In no time, Real switched from 4-4-2 to 3-1-4-2, generated local compactness and isolated Alaba, Ribery and Schweinsteiger on the left. The only options remaining were the back pass to Dante and restarting their buildup phase. Sacchi would have been proud: Real had won the first act in a psychological duel. After the back pass and a short circulation within the defensive line, Kroos dropped again between Dante and Boateng to receive the ball. Real’s funnel was formed and Ronaldo pressed Kroos again to urge him towards it. This repetition within such a short time suggests that it was planned into the construction of their pressing mechanisms. However, Bastian Schweinsteiger had no desire to repeat history and launched dynamically into the funnel, called for the ball and moved it directly to Boateng. This action was a good remedy for the more passive and passwegorientierte (passing lane oriented) playing style of Real at this early stage in the game. Boateng played the ball to Robben. Real did not respond well. Rather than act like Carvajal did previously, as a blocker, Coentrao remained deep. As a result, the whole midfield had to fall back, which resulted in Robben in finding space in front of them. Here he was able to cut in behind the gambling Real strikers and receive the pass from Schweinsteiger, bypassing the second isolation zone. 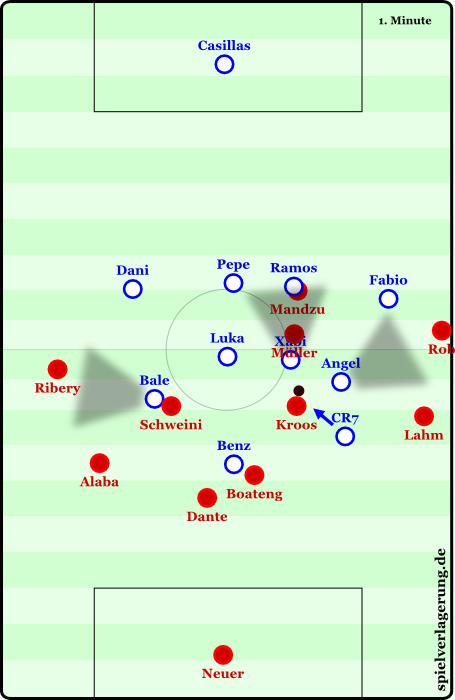 Real was deep and flat – Bayern controlled the central region. Ancelotti even threateningly abandoned his dugout. It was clear to see that Real was not prepared for such a situation. The mechanism of controlling the space, which appeared to have been trained intensely, was abandoned. Instead, the players fell into the traditional patterns of movement. In this case, Alonso moved out to press Schweinsteiger while Modric and di Maria secured the diagonals. This is the triangle defense theory (taught so well by the DFB for some time now). In the context of the isolating, space-controlling approach Real had apparently prescribed in this game, this behavior was incongruous. With a simple pass, Schweinsteiger found Robben in space in front of Modric. Alonso’s behavior also caused a dilemma for Modric: Either he moved up to attack Robben and opened the ten space for Ribery and Müller or he allowed Robben to switch the play in front of him. The structure of the funnel was broken due to the advanced position of Alonso. Bale had to close the passing lane to Alaba and Modric had to cover the passing lanes of Ribery and Müller – which was hardly feasible, even for him. In this sense, Ronaldo forcing Schweinsteiger to first pass into the danger zone and then move up did not fit the game plan. Robben then succeeded in getting into the ten space and passing to Ribery, but he moved the ball directly to Alaba instead of Mandzukic and Müller; who could have created a quick combination. Meanwhile, Real could defend their crosses. Yet they still got an earful from Ancelotti in response. A clear sign that Coentrao, Alonso, and Ronaldo, did not behave as planned in this situation. As mentioned in other analyses and postulated by MR, against Bayern a manager must come up with several tasks to disrupt their rhythm and counter Guardiola’s adjustments. Accordingly, Real’s defensive plan was not limited to the high midfield press with the two isolation zones. Particularly during goal kicks, back passes, and players receiving the ball with their back to the direction of play, they changed like lightning to Angriffspressing (attack pressing). This was both like the hunting and man-orientation they had already practiced under Mourinho but also a bit passive and isolating. Even hybrids occurred. Let’s look at three scenes as examples. Alaba had to turn with the ball towards his own goal (the direction of view is shown in the figure through the opening in the circle). Seeing this trigger, Bale immediately put pressure on Alaba. At the same time, Benzema also aggressively attacked from the side, leaving Alaba only the back pass to Dante, who also had to turn away to receive the ball. Benzema continued his arcing run to maintain pressure and prevent Dante turning. Dante could only pass to Manuel Neuer. In the meantime, Schweinsteiger and Kroos recognized the gravity of the situation and ran up gesticulating for a pass into the middle. Neuer could handle Dante’s pass in an open position and would be able to play the ball safely in the open center due to the wide position of Benzema and Ronaldo. However, since Modric and Alonso quickly switched and ran at the Munich double six, such a pass would have been extremely risky. A lost ball in the center, deep in his own half, with fanned out center backs and high wingbacks would certainly have give Real a quality scoring chance. Had Ronaldo better controlled the pass route to Boateng with his run, only a long ball would have been possible. So Neuer took advantage of the small gap on the other side of Boateng. However, Ronaldo arced his run well and forced Boateng to turn toward the sideline. After two more one touch passes near the touchline, the ball ended up with Coentrao. The Angriffspressing had achieved its goal. Contrary to popular procedure, Real did not cut off goal kicks via man-marking. Instead, the focus was on controlling the spaces and setting up specific pressing traps. This was also the way of playing they owed to Bayern. Boateng and Dante fell almost to the byline, ie on a level with Manuel Neuer. The resulting open space in the center of the back four was occupied by Schweinsteiger and Kroos. In a man-oriented situation, either six players from Real would have to move into the final third or Dante and Boateng would have to be completely left free. Either option would result in enormous instability during long balls from Neuer (or in the second case from Boateng and Dante). Real therefore confined themselves to occupy the gaps between the players. Thus, they were able to quickly restore access and cut the targeted player off from his teammates after a short pass. There was an interesting asymmetry, which went well with these established types of players. Because of Benzema’s left-sided position in relation to Alonso, Kroos was in his cover shadow and Schweinsteiger tended to be free. On a pass to Schweinsteiger, three smart and combative players would have been responsible for the isolation, while the dynamic Cristiano Ronaldo could lurk on back passes to Neuer and Boateng due to the higher position of Modric. The positioning of the gaps also allowed Real to immediately build up pressure on passes to the deep, fanned out center backs and isolate them. Each winger had to start their run from the outside, to place the full-back in their cover shadow and to prevent them turning onto their strong foot. Benzema would assist with a matching arced run to first cut off Kroos, then draw the far center back and Neuer into his cover shadow. Meanwhile, Bale lurked on passes to Schweinsteiger and Modric could act as a sweeper behind them. Unfortunately, there was a lot of “coulda, woulda, shoulda” happening. Neuer probably had this thought as well and kicked the ball long. Since only four players moved out wide, Real was able to control the second ball via overloads. Real’s exploitation of poor sight lines and positions for generating pressure in their pressing has already been mentioned several times. 26 minutes in, this strategy reached its climax. Despite the successful individual actions of Bayern and small errors at the start of the game, Real managed to keep Bayern in their own half for more than 30 seconds and drive them from one unpleasant situation to the next to finally win the ball. 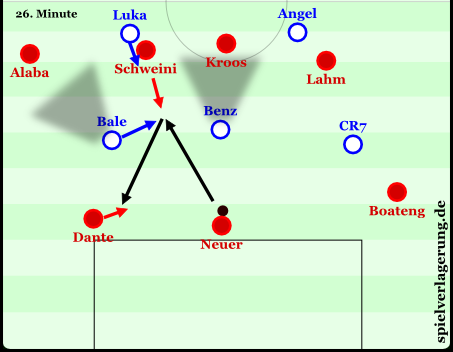 My colleague RM wrote: “… against Real it was striking how much difficulty the Bayern had with finding the right reactions – not only in the passing game, but even in free runs – against the varied tasks of the opponents.” We should take a closer look at this scene analysis. One of the coolest sequences of pressing actions and reactions in the game. A Real clearance to the right landed at Kroos. Real was very indented and the left side was wide open. Kroos’s head was turned away when receiving the pass. The strikers, Ronaldo and Benzema, took advantage of the opportunity to build pressure and prevent Kroos turning his eyes upfield. Because of the deep position of the remaining players they couldn’t begin an attacking press. Due to the perceived pressure, Kroos played the ball back to Dante. At the moment of the back pass, di Maria, the only non-defensive player still standing on the left side of the pitch, launched forwards to pressure Boateng. Theoretically, he left behind a huge open space. He knew, however, because of Dante’s Sichtfeld and the force exerted by Ronaldo’s continued run, that the ball could only be played to Boateng. Because of his anticipation, di Maria was already close to Boateng. By looking at the passer, Boateng’s attention was again not ideal. The back pass was blocked by Ronaldo while di Maria prevented a forward pass towards Lahm. In this pressure situation, Boateng and Dante showed their individual technical class, but also some strategic deficiencies. Boateng took the ball with a move towards his own goal and briefly bought himself some distance from di Maria. At the same time, Dante sparked a running feint from the cover shadow of Ronaldo. Boateng used the resulting pass option to return the ball to Dante. At this moment, however, it would have been a better option to feign a pass and turn in the direction of the open side. So the games went on. Because of the run feint and the pathway back from a deeper position, Dante was able to control the ball in an open position. Schweinsteiger hurried to meet him, to assist in breaking free of the press. It actually looked as if the scene was over. However, di Maria did not give up and continued his sprint. He ran at Dante from the side to continue to put pressure on him and to push him towards the sideline. Although Dante duped di Maria and let him run into the void via a short hook, the Argentine still achieved his goal. The split-second hook gave Bale access to Schweinsteiger to prevent him turning after receiving the pass from Dante. Thus the ball could only go right back to Dante. Bayern was under pressure again and had to claim the ball with poor vision. Meanwhile, behind them, Real had reset their positioning. The two pressing players at the beginning of the move were now four. Bayern faced a true Angriffspressing (attacking press from the forwards). Dante was isolated and outnumbered. He could only pass back to Manuel Neuer, who had already run forward from his goal to help out. After the back-pass by Bayern, Real went into goal-kick mode, with the small but fine exception that Neuer and the center backs constructed a goalkeeper chain a little in front of the 18 yard box. Angel di Maria dropped back into midfield again after Bale’s forward run. The smooth change was complete. As usual, Real’s attacking players did not man mark Boateng and Dante. Instead, they occupied the channels to quickly get access. Real was in an extremely high 4-3-3 midfield press. The pressing traps were constructed similarly to the goal kicks. Unbelievable but true: Although a long ball was possible, Real had five people in the Bayern half and the significantly more pressing resistant Lahm was open near Ronaldo, Neuer fell right into the pressing trap to Schweinsteiger. He was immediately under pressure and was lucky not to lose the ball to Bale’s backwards pressing. The pressed ball landed at Dante. Schweinsteiger tried to stimulate the buildup game again. Directly after the press he moved out left, where he received the ball from Dante. Due to Schweinsteiger’s field of view, which was directed to the center, Real dispensed with a strong indenting near the ball and instead simply aligned the forward of the 4-3-3 in Schweinsteiger’s direction. As a result, Bayern tried to get through to Ribery and Alaba on the left side via the third man, Kroos. One could almost believe that Real intentionally backed off the pass route to Kroos. Since a pass towards Lahm was very difficult to play because of Kroos’s Sichtfeld and path, Luka Modric could anticipate and easily intercept the next pass. Real’s pressing efforts were finally rewarded. What looked like wild running around was a terrific game against the fields of view and Bayern’s pursuit of short-passing solutions. Real moved with incredible security between building man-oriented pressure and a rather passive space control. In hindsight, I’d like to stress that the first two goals of the game came from set pieces. The corner before the 0:1 goal came off the clearance of a well-played counter. Even in the 0:3 goal many aspects of Real’s pressing came together. Let’s look again at how it came to a counter attack. Bayern played a long ball to escape the higher pressing that fell promisingly on Real’s left side. Although Real had established a local compactness to defend the long ball, the protection of the space behind them was very poor due to the wide open and disengaged position of the midfield line. While Ramos succeeded in heading the ball long, it fell to di Maria, who was immediately counterpressed by Lahm and Ribery and lost the ball. Lahm played the ball to Müller and moved with Ribery to overload the left side of Real’s defense. Again, Real succeeded in producing, within the shortest possible time, a local compactness to isolate Lahm and Müller on the wing. Robben and Ribery were in the cover shadow and unplayable. Real’s position from this backward movement seemed improvised, but it shows a characteristic situation of both games in this Champions League semi-final. The near six (Xabi Alonso), together with the full-back and the winger, created a small sickle around the ball carrier. All diagonal and horizontal options were cut off. The only options remaining were a sprint along the line or a hopeless dribble. In this case, Müller tried a feint with an immediate cross that Xabi Alonso headed out easily. After changing counterpressing actions di Maria was able to resolve the situation with his dribbling. Schweinsteiger and Kroos were positioned centrally while the disaster took its course. The third goal was also preceded by a promising Bayern attack. Real was, for once, unable to stop the rapid shift back of the ball from the side into the center. Since Xabi Alonso was still out of position to build up the isolation, the passing lane from Schweinsteiger to Mandzukic was briefly open. The tension built up in anticipation of the pass. However, since Bale tracked Alaba’s diagonal path inside intelligently and the intermediate line space wasn’t occupied, a layoff would likely have been intercepted in the middle. The only realistic option would have been for Müller to absorb the pace of a direct through ball into the gap between Ramos and Coentrao. This would, however, have been difficult to play because of Ramos’s offset position. So, Schweinsteiger played the safe pass squarely to Kroos, who used the spaced opened by Alaba’s run to involve Ribery. This enabled him to take advantage of his momentum and pull against the move Carvajal made inside his own penalty area. Situation before the counter and the 0:3 goal. Again, it took only a few fractions of a second to form a funnel-shaped local compactness around Ribery. The transfer mechanisms were particularly impressive. At the beginning of Ribery’s dribbling, Pepe covered Alaba, who was handed over by Bale after he tracked him into the compactness. As Ribery was transferred to Pepe, Modric immediately fell back to Alaba and Bale moved even further back. While covering Alaba, Modric moved slowly toward Ribery – always careful to keep Alaba in his cover shadow. Bale also presented himself near Ribery, but he covered the Rückraum (area near the D outside the 18 yard box), where Kroos and Schweinsteiger were already lurking in his cover shadow. When the square pass came, Bale intercepted the ball before Schweinsteiger’s counterpressing attempt arrived and laid it off to di Maria. Schweinsteiger had not recognized the trap and was even clamoring for the ball. This displayed yet another advantage of the space-controlling coverage. Because Real’s players usually stood slightly in front of the Bayern players, they had enough time to control and pass the ball. For Sacchi, the space controlling (partial) pressing was always a means to impress in the dynamics of the game. These dynamics often occur at the beginning of the game and after important events. The initial phase has therefore been extensively discussed in the context of this analysis. The kick-offs after the goals would have been important moments to see. Unfortunately, the broadcast showed numerous replays of the goals rather than the ensuing kickoffs. However, the fact that Bayern inevitably resorted to a long ball after each kickoff tends to be a sign of the quality of Madrid’s pressing. Luckily, we were able to see the first kickoff after half-time. Due to the effect of the half-time speeches and possible tactical changes – Guardiola brought Javi Martinez on for Mario Mandzukic – it was a key taktikpsychologischer moment. Real immediately pressed, trying to isolate the Bayern players in the center. Javi Martinez assisted them by playing Ribery with a poor Sichtfeld (field of view) – the usual trigger to attack for Real. Bale ran directly at Ribery’s back to prevent him turning to the outside, and drove Ribery into the center. Modric also moved to increase the local compactness and his coverage shadow. Ronaldo positioned himself higher in the half-space to cut Ribery off from the right side of Bayern. The funnel struck again. Ribery could only pass backwards. This was followed by a brief hounding, similar to the scene in the 26th minute. However, Bayern were able to successfully resolve the situation this time. The ensuing attack, however, was played too hastily and promptly landed at the feet of Bale. It was once again, “business as usual,” for Bayern. As a result, Real could calm the game down. The isolation became inconsistent and less intense. Ronaldo was limited to blocking the left half-space, so the attacks from the triangle of Benzema, Bale and the slightly advanced Modric were stunted. The three continued to have a great match with their cover shadows, which managed to benefit the dynamic center backs Pepe and Ramos and the defensive Xabi Alonso. They could see open passing lanes from their deep positions and thus plot out their Herausrücken (moving from their position to intercept or press). The funnel with four or more men was barely seen. If necessary, however, the local Kompaktheiten were still produced to isolate Bayern on the wings. Due to the restriction of the sideline, having three people in the immediate vicinity of the ball was perfectly adequate. In the 72nd minute, Guardiola brought on two fresh offensive players, Götze and Pizarro, which could be interpreted as a last ditch effort to start a comeback. Ancelotti made three changes in response. The first exchange was like for like (Varane in the 75th minute for the yellow carded Ramos), and signaled the ensuing changes in approach. Guardiola was faced with new challenges that could hardly be more different. After Isco replaced Benzema in the 80th minute, Bale moved to the right forward position while Isco took over the right side of midfield. Di Maria from that point on played somewhat deeper, almost as an additional full-back in a 5-3-2. The pressing line was withdrawn slightly so that now a deep midfield press was played. The two original pressing traps were retained, but compressed by additional players in the key positions in midfield and defense. The spaces to be covered were smaller and the distances required to shift became shorter. This alignment naturally reduced their counter threat by removing players from higher up the pitch- but with Bale and Cristiano Ronaldo, Real was able to bridge large spaces quickly. Only four minutes later, Ancelotti brought on Casemiro for di Maria. This change seemed rather defensive on paper, however, on the field it was a total contrast to the 5-3-2 (-0). Real suddenly played 4-3-3 and an almost crazy Angriffspressing. The forward line morphed with Isco on the right, Bale in the center and Cristiano Ronaldo on the left. Behind them Casemiro and Modric pushed way up into Bayern’s half. The ball carrier was consequently attacked at full speed. As a result of this hounding we have the scene depicted in the 86th minute. Carvajal had moved forward from his full-back position over Götze and Alaba to press Dante. Isco and Bale covered the short pass routes out from behind. Ronaldo managed to at least have access to Boateng and Lahm from his central position. Despite having eight players in their own third, Bayern could not free themselves from the stranglehold. After a brief Rondo with Götze and Alaba, Dante could only kick it long into the overload near the center line. This time the pressure led to the free-kick and the final goal of the night. Real showed, in an impressive way, how a game can be tactically controlled and dominated psychologically without a lot of possession. Pressure was actively triggered by a bad Sichtfeld and an unfavorable playing position, while the space was rather passively controlled via local compactness and cutting off the passing lanes. Many of these issues can be traced back to Arrigo Sacchi. It is not unlikely that Ancelotti has been taking some of his teacher’s advice to heart. The coaching of the Real players was striking and the tactics involved intense training work over the previous weeks. Kroos and Schweinsteiger actually played a lot of square and back passes. I hope after this analysis it is clear that this also contributed quite a lot to Real’s victory. It remains to be seen whether this type of pressing can be carried over to an opponent that is less focused on safe ball circulation than Bayern and Barcelona. Cutting off the pass routes from the center to this degree could create an instability against risky passes. This, in combination with direct and fast layoffs, could create some promising attacks for opponents of Real. Both are things at which Atlético Madrid excel. In this context, the loss of Xabi Alonso will play a large role. He appeared in the midfield alongside the immensely powerful Bale, Modric, and di Maria and yet was still likely to be a weak point in controlling space. He often left short gaps that could be exploited, e.g. by Koke. The alternatives in his position would be Asier Illarramendi and Sami Khedira. Casemiro has been mostly used for defensive stabilization in one of the half positions in the 4-3-3. Illarramendi could really benefit Real. He has played very successfully as the sole defensive six for the Spain U21 team. In higher pressing, Modric mostly pushes up, so his partner must cover the space behind alone. Illarramendi would thus be a suitable and strong choice. Sami Khedira has also been hinted at by the German media as a potential replacement for Xabi Alonso. However, he will usually act more vertically, as providing security does not interest him so much. This could lead to Modric being restricted in his movements and even forced to defend – similar to Bastian Schweinsteiger at the European Championships 2012. This would definitely have a negative impact on Real’s space control. If, however, Ancelotti relies on a man-oriented, direct approach and wants to contest Atlético physically, the German national could be a real alternative. Didn’t Bayern Munich’s formation had a lot to do with the success to isolate and to bait the midfielders into the funnel like structure defense and high pressing? Their positional structure wasn’t there that night. What do you think?